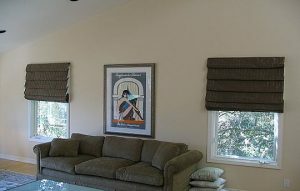 Roman Shades – Ray Ev, Inc.
Ray Ev offers quality finished Roman Shades in 10 different styles. We can create a simple Flat Shade to sophisticate Balloon Shade with your own fabric or our in stock fabric to your measurement. We use premium clear pine headrail and standard lining in ivory or white. We provide color coordinating cords, tassels and cordlock. Cord and pulley available upon request at no charge option. 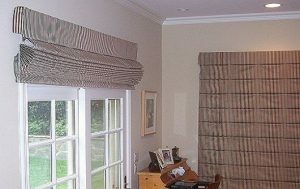 Flat Pleated Roman Shade creates rear-facing stay pockets which add detail to the front of the shade. It pulls up easily with a clean fold which gives a simple and a straight flat look. 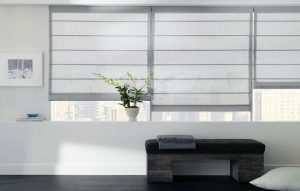 Soft Fold Roman Shade uses overlapping folds that creates soft appearance. It uses hobbled fold and the shade is always lined which is essential to the hobbling. It gives cascading look when it is raised and folds top to bottom. Front Pleated Shade is a flat style with front-facing stay pockets that adds detail to the front of the shade. It opens up with tighter stack. 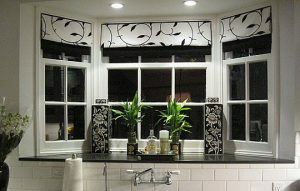 This shade can be made up in any type of fabric but large fabric prints are interrupted by the stay pockets. Front & Back Plated Shade is a flat style with rear & front stay pockets that adds detail to the front of the shade. It takes most tighter stack due to amount of space taken when it is pull up. 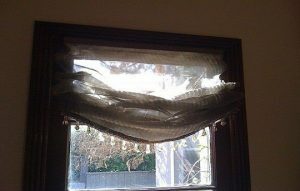 This shade can be made up in any type of fabric but large fabric prints are interrupted by the stay pockets. 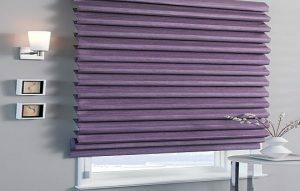 Grommet Shade has one grommet pocket between two pleats of equal size. The stays on this shade are clear aluminum. The shade’s lifting cords are routed through the grommets. 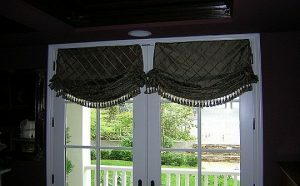 This shade can be made up in any fabric but if the fabric is sheer, the shade must be lined or the face fabric will tear at the grommets. Large prints fabric not recommended due to interrupted by the grommet folds at the back of the shade. 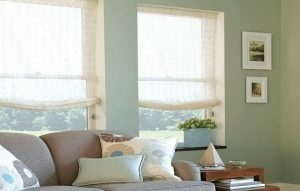 Relaxed Shade uses one square panel of fabric with an one oval rod on the bottom to keep the panel flat when the shade is down. The large fabric prints can be displayed to their best visibility with the soft style on the bottom. 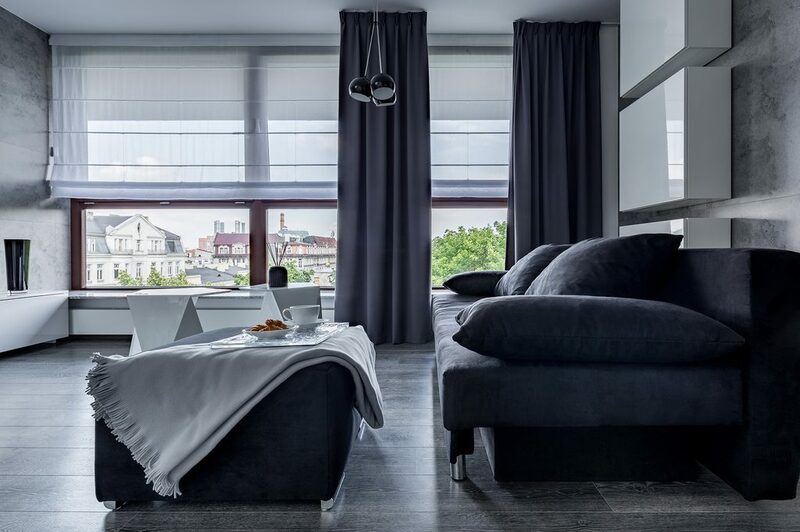 Relaxed with Tails Shade uses a square flat fabric panel and the narrow tucked side panels are created by tacking the fabric to the lining at each pleat. This shade swags gracefully in the center when it is made with soft and pliable fabrics. 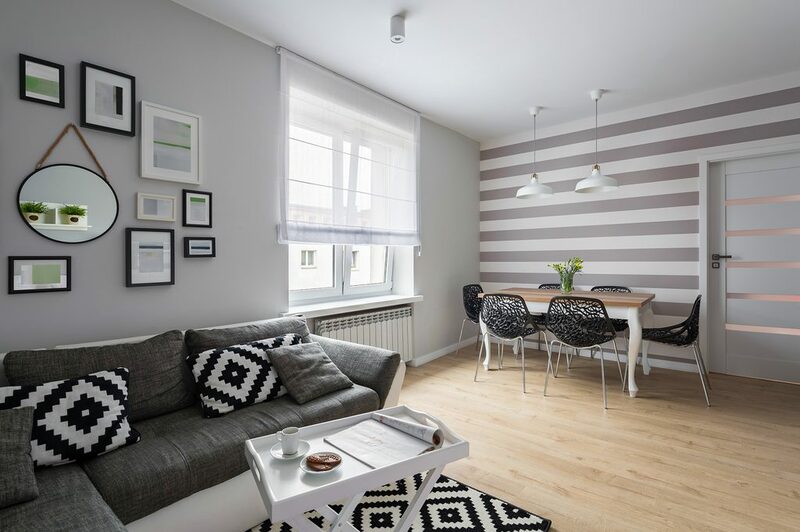 The Shade is ideal for fabrics with large prints due to the square flat fabric panel. The finished height is measure from the top of the shade to the top of the center swag and it does not include the swag or tails. Balloon Shade with a single pouf uses a loose relaxed style to create a simple pleat at the top center that falls into a relaxed pouf on the bottom. The tuck at the top of each width of fabric can be adjusted for wider shades. Balloon Shade with a multi-pouf uses inverted pleats along the top of the shade that fall into a full balloon poufs at the bottom. The multi-pouf creates elegance style that makes it a good choice for a formal setting.